The Anglican Archbishop of Cape Town has condemned recent shooting, looting and killing in South Africa's biggest city aimed at African immigrant communities and described by some critics as xenophobia. "I have been shocked at the shooting, looting and killing that has been happening in parts of Soweto, the place where I grew up and regard as home," said Archbishop Thabo Makgoba on January 24. Soweto is a dormitory city of Johannesburg that was at the center of the struggle against the racist apartheid ideology during the 1970s, 80s and 90s when it was South Africa's largest black township. Makgoba was in Davos, Switzerland to speak at an Open Forum discussion entitled: "Religion: A Pretext for conflict." "We cannot allow the current tensions to run at such high levels, even less to flare up into violence and the targeting of residents from elsewhere in Africa. "I condemn the killing and destruction of property, and deeply regret that a law enforcement officer is said to have been involved," said Makgoba. "We all belong together and no one should be excluded from township life or be chased out. Revenge will not solve problems, only a display of our innate goodness and generous forgiveness will take us forward." The South African government continues to deny that there is xenophobia in South Africa, the African Diaspora Forum wrote in an open letter to President Jacob Zuma published on January 24. "Despite the escalation of violence over the past 6 years causing numerous deaths, the government has denied that there is xenophobia... always questioning the nature of this violence and attributing it to 'crime', instead of recognising it for what it is - xenophobic violence," ADF chairman Marc Gbaffou said in the letter. 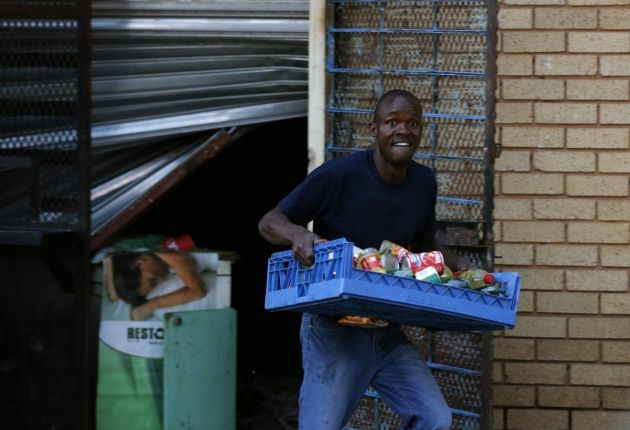 On the same day South Africa's deputy minister in the Presidency, Buti Manamela, speaking at the Rhema church in Protea South, Soweto said the looting that flared up cannot be justified. Manamela ascribed the looting to crime and not to xenophobia. He said young people reportedly claimed they looted foreign owned shops to protect the economy of Soweto. "We should stand up and 'say not in our name'. You are not doing this in our name and we are not going to allow it. "There is a strong sense of entitlement and shifting the blame instead of taking responsibility," he said. "Crime is crime - you cannot justify it." He condemned the looting saying those leading it would turn against their neighbour once there were no foreigner-owned shops to loot. "They will look next door and say 'you are Venda therefore you must go to Venda, or, you are a Xhosa you must go to Pondoland' (an area in the Eastern Cape Povince)," the deputy minister said referring to two of South Africa's ethnic groups.